So during a recent conversation with friends and supperclub diners who wanted to recreate this dish, a certain mentioned ingredient quite frankly drove me to almost boiling point. That culprit is Tamarind. Okay, so you might be wondering what is the big deal about this? Well, let me tell you why. There is no tamarind in Beef Rendang. It simply does not belong there. It's sacrilegious! After doing a fair bit of googling serious research, I can see why the confusion occurs. Most recipes available online committed the sinful faux pas of putting tamarind on the ingredient list?! Now in order to clarify things, let me first introduce you to the inferior cousin of Beef Rendang. 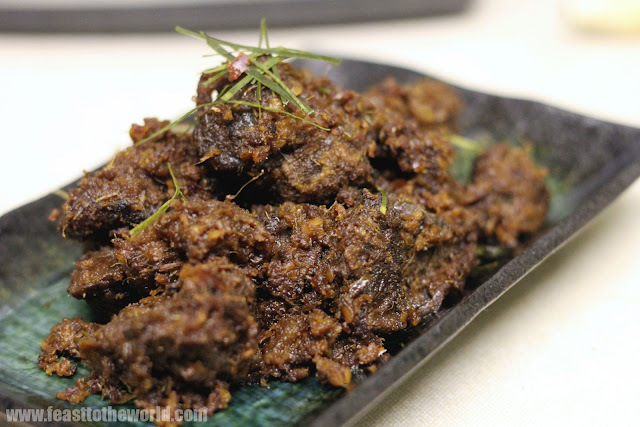 On the face of it, both Beef Serondeng (not to be confused with the normal Serunding/Serondeng which is a meat floss version of this) and Beef Rendang are easily confused due to their similar appearances. However, on closer inspection, you can see that the former is completely dry and coated with crispy grated coconut; the Rendang on the other hand, has a slightly wetter and moist consistency. They are also both prepared and cooked in very different ways. 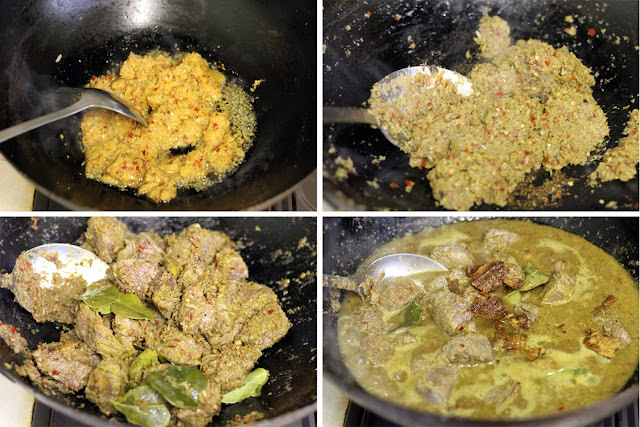 For Beef Rendang. the meat is braised alongside all the ingredients for hours in coconut milk until it becomes almost dry. The cooking process changes as it cooks; from braising to frying as the coconut milk slowly evaporates and reduces, leaving behind a layer of coconut oil that gently fry and caramelises the meat, yielding a rich and buttery bites. 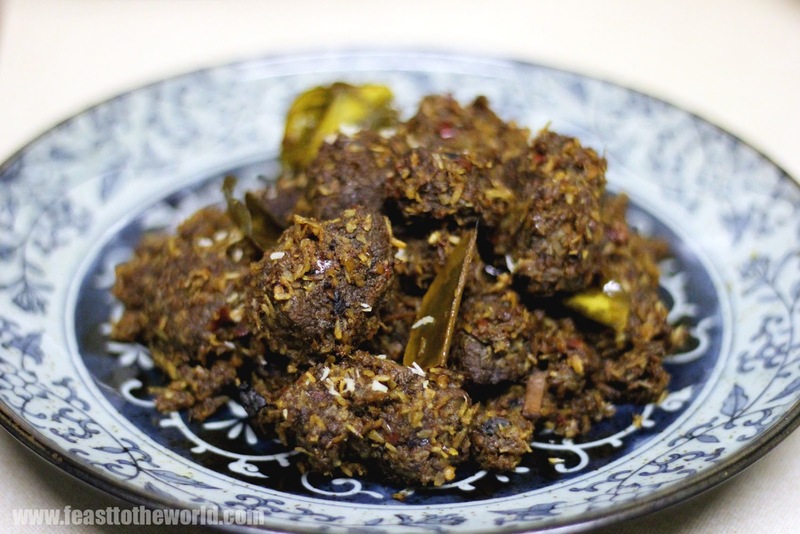 As for Beef Serondeng, the meat is braised in tamarind and water, no coconut milk is used. 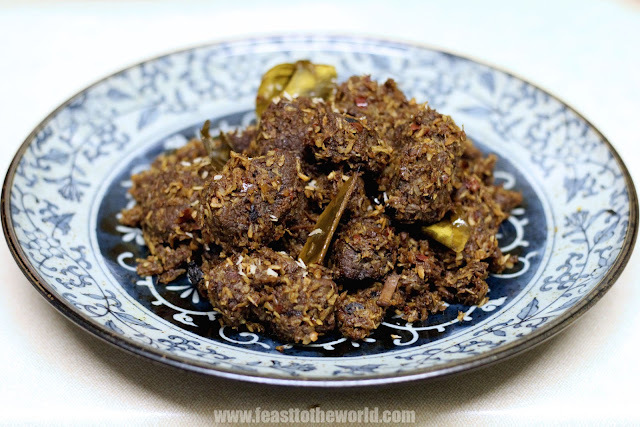 The fried grated coconut are added only towards the end of cooking to retained their crispy crunchiness. What you get is a very different, completely dry and crispy dish offset by the hint of tangy tamarind. So now you see the reason behind my frustration. A noteworthy mention is that to make this dish, try to get your hands on the freshly grated coconut instead of the dried desiccated one. The end result will be so much nicer. A little disclaimer here, my coconut grater is broken and henceforth I had to use the dried desiccated coconut but fret not, a new grater is now in the post, on its way to my lovely kitchen. Heat some oil for shallow frying in a pan. Fry the freshly grated coconut for 2-3 minutes, until golden and crispy. Drain on some kitchen paper. Alternatively, if using desiccated coconut, fry in a dry pan over low heat , about 5-6 minutes, until lightly brown. Remove and set aside. Combine all the ingredients for the rempah in a mortar and pestle and pound to a smooth paste. Alternatively, blitz everything in a food processor. Heat the oil in a wok/ large pan over medium heat. 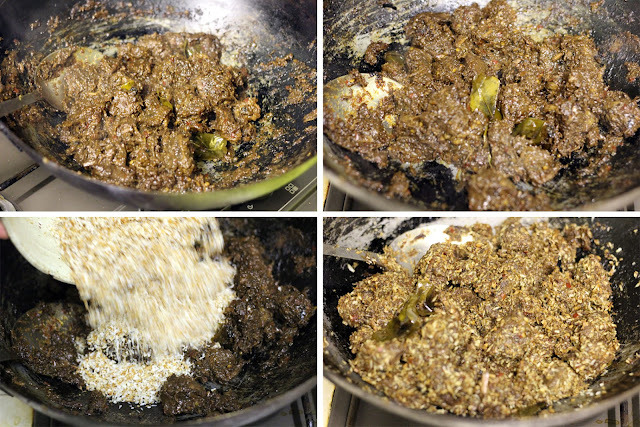 Add the rempah/spice paste and stir-fry for 12-15 minutes, until fragrant and most of the moisture has evaporated. The paste should have deepened in colour. Add the tamarind and the beef and continue to stir-fry for another 3-4 minutes before adding the water. Bring to the boil and add the kaffir lime leaves, palm sugar and season with sea salt to taste. Lower the heat and leave to simmer for 3 hours or more, until most of the liquid has been absorbed and the beef is tender. You may need to adjust the timing. Cook the beef for longer, adding a touch more water if necessary. Add the dry-fried coconut and stir continuously until well combined. I love your recipe posts, and all the extra information! This one is making me smile, too! Thanks for this. My husband and I were just arguing over whether to put tamarind into rendang. (He thinks yes and I think no).